Extrait du - excerpt from Serie I Vol. 4. By C. Grabowski. By Claude Debussy (1862-1918). Edited by Christophe Grabowski. Durand Oeuvres Completes de Claude Debussy. Classical. Book Only. Composed 2001. 28 pages. Editions Durand #DD 01603200. Published by Editions Durand (HL.50565687). 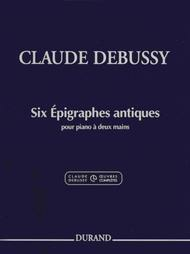 Claude Debussy's Six Epigraphes Antiques for solo Piano. 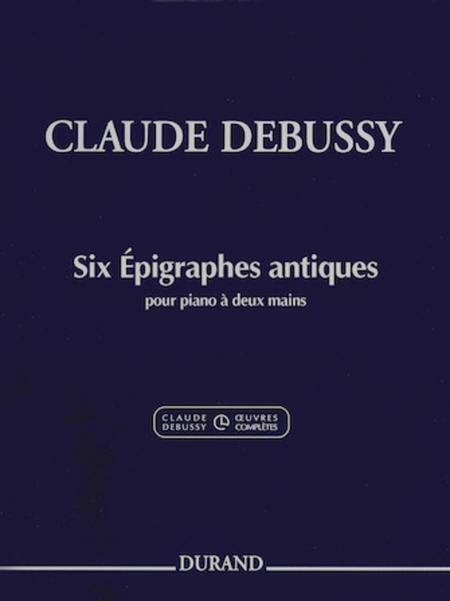 The present edition of the Six Epigraphes Antiques is an excerpt from the Complete Works of Claude Debussy (Series I, volume 4). The Six Epigraphes Antiques are a prime example of a highly successful double transformation of a former work (Les Chansons de Bilitis): initially as a piano four-hands version, and subsequently as a version for solo piano. The former was published at the beginning of 1915, followed shortly thereafter by the latter version, which is the subject of this current edition.2012 marks 150 years since the birth of Claude Debussy and to celebrate this anniversary, Durand have made available more titles individually fromtheir critical editions of his works. List of titles:La Fille aux cheveux de lin (DD 01598300) Danseuses de Delphes (DD 01597100)The Little Shepherd (DD 01599400) Six Epigraphes Antiques (DD 01603200) Des pas sur la neige (DD 01604200)2e Arabesque (DD 01603800). Beware - this is Debussy's solo piano ("deux mains") version, not the 2-pianist version you might be expecting.